We report a case in which a radial arterial line was placed prior to induction of general anaesthesia in a 76 year old male with prostate cancer and multiple co-morbidities who presented for thoracoscopic resection of a right lower lobe carcinoid lung tumor. The patient's intra-operative course was complicated by acute blood loss requiring conversion to an open procedure. A subsequent injury to the superior vena cava resulted in the need for immediate re-exploration at the conclusion of surgery. While the arterial line was still indicated in this patient's postoperative course in the ICU, malfunction on post-operative day one resulted in removal of the catheter. The catheter was secured by stay sutures and during the attempt to cut these sutures, the arterial catheter was inadvertently severed and a fragment remained within the patient's radial artery. Surgical intervention was required to remove the retained catheter and the patient recovered without evidence of residual injury or deficit to the artery and extremity. Literature review reveals only one other case report of a retained catheter in a radial artery caused by accidental transection during removal. We review indications for arterial line placement, complications, as well as methods for securing arterial catheters. Arterial lines are frequently indicated and routinely used in the care of perioperative and critically ill patients. Indications for arterial line placement include need for continuous beat to beat blood pressure monitoring, inability to use indirect blood pressure monitoring, frequent blood sampling, and arterial blood gas sampling [1,2]. However, placement is not without complication. Some of the most common complications include thrombotic, infectious, and vascular etiologies. Rarer complications include nerve damage and severe ischemia requiring surgical intervention . Thrombosis formation and artery occlusion from arterial line placement occurs because of changes to the integrity of vasculature induced by presence of an intra-arterial catheter. Studies have shown a linear correlation and increase in incidence of thrombosis with increased ratio of outer diameter catheter to vessel lumen diameter [3,4]. This is a plausible explanation for the higher incidence of radial occlusion in female patients with radial artery catheters . Multiple punctures, hematoma formation, and duration of cannulation have also been shown to be risk factors for vessel thrombosis . The incidence of infectious complications of arterial line placement can be reduced by using aseptic technique and minimizing arterial cannulation duration to less than 96 hours. While prophylactic antibiotics do not decrease this risk, catheters bonded with antibiotics may confer some protection. Cut-down technique for arterial catheter placement has also been shown to be associated with a higher infection risk. Meticulous handling technique by caregivers to avoid contamination of the entire monitoring system is also important in reducing infectious risk . Vascular complications from arterial line placement include hematoma, pseudo aneurysm, and arteriovenous fistula formation and are often a consequence of traumatic placement. The management of these complications range from conservative observation to surgical intervention. While all aforementioned complications have been well documented, studies still consistently show that arterial cannulation is deemed to be a relatively safe procedure with a major complication rate of less than 1% [3,5-7]. A 76 year old, 30 pack year smokers with a history of prostate cancer, gastroesophageal reflux disease, hypertension, and moderate aortic stenosis presented for lung resection of a right lower lobe carcinoid tumor. After placement of standard monitors, a preinduction arterial line was placed under sterile conditions in the left radial artery with local anaesthesia. General anaesthesia was subsequently induced and a doublelumen endotracheal tube placed uneventfully for a videoassisted thoracoscopic right lower lobectomy. The intraoperative course proceeded with stable hemodynamic parameters until acute haemorrhage was noted, and the procedure had to be converted to open. Via thoracotomy, the surgical team found an injury to a right middle lobe branch of the pulmonary artery, which had to be sacrificed along with the right middle lobe. After hemodynamic stabilization and completion of the procedure but prior to emergence, the patient was noted to have large blood loss via the chest tube and had to be explored again for repair of what was found to be an additional injury to the superior vena cava. There was a total estimated blood loss of 6.5 L upon completion. The patient was resuscitated with blood products and crystalloid and transported to the ICU intubated and on vasopressor support. The patient was able to be weaned from cardio active medications and was extubated in the ICU on the same day. On postoperative day one, the arterial catheter was noted to be malfunctioning with a poor waveform and inability to withdraw blood. The arterial line was discontinued by first cutting stay sutures that had been placed on arrival to the ICU and then attempting to extract the catheter. However, the catheter was noted to be severed with a distal catheter segment retained in the radial artery (Figure 1). The patient and care teams were informed and an unremarkable neurovascular exam was performed. A vascular surgery consultation noted intact vascular perfusion to the left hand, but given the risk of thrombosis and embolization of the retained catheter, urgent surgery was recommended to remove the foreign body. The vascular procedure was performed under monitored anaesthesia care with a dexmedetomidine infusion and small boluses of fentanyl, supplemented by local anaesthesia provided by the surgeons. After identifying the location of the retained catheter within the radial artery with ultrasound, a small incision was made directly over the area and the radial artery was dissected free. The retained catheter was removed in its entirety without difficulty. The artery was repaired and the wound was closed. Perfusion of the patient’s left hand was maintained postoperatively without evidence of distal ischemia. 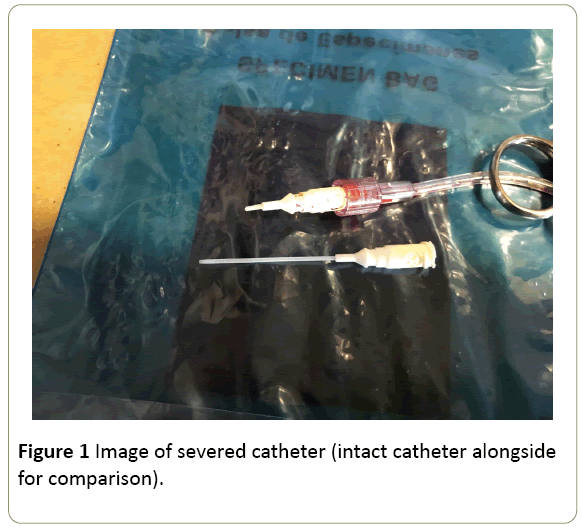 Figure 1: Image of severed catheter (intact catheter alongside for comparison). Arterial lines serve multiple roles in the perioperative and critical care arena. Indwelling arterial lines are used routinely for continuous hemodynamic monitoring during major surgery and in critically ill patients. They are also utilized for blood gas analysis and multiple blood sampling. Approximately 8 million arterial catheters are placed yearly in the USA and 2.5 million in Europe . The most frequently utilized site for arterial cannulation is the radial artery because of its well documented low complication rate and easy access . In a review of 19,617 radial artery catheterizations, factors that contributed to higher complication rates were investigated . Arterial cannulation in this setting is deemed to be a relatively safe procedure with a major complications rate of less than 1% [5-7]. Complications associated with arterial lines include thrombotic and infectious etiologies. The most common complication is temporary occlusion of the artery with an incidence of 19.7% [8,10]. While temporary occlusion is reported quite frequently, serious ischemic damage was extraordinarily rare with a complication in less than 0.09% of all cases [8,10]. Nevertheless, there have been reports of serious sequelae of ischemia including necrosis, and amputation of digits and extremities [8,9,11,12]. Ischemia in this setting is almost always a result of thrombus formation or embolism of blood clot or tissue [10,12,13]. It is exceedingly rare for a portion of the catheter to dislodge or shear off. Indeed, these are such rare events, that their occurrence warrants reporting and often results in publication as case reports [5,7,14-16]. It is not possible to be certain about the cause of the catheter shearing, but most clinicians suspect that the shearing occurs during difficult placement of the catheter that results in catheter trauma. Repeat attempts or multiple passes with the introducer needle or wire are thought to undermine the integrity of the plastic cannula and result in shear strain [5,17]. While most catheter damage occurs during placement, there are some case reports of catheter damage that occurs during catheter removal . In a closed claims analysis on injuries from peripheral catheters published in 2006, there were only seven arterial catheter claims involving the radial artery. Of these, two cases involved a retained catheter or wire, two were radial nerve damage from multiple punctures, two involved arterial occlusion and hand ischemia, and one resulted in carpal tunnel syndrome from hematoma formation during placement . There are multiple options for securing intravascular cannulas. Most clinicians secure catheters with adhesive dressing or commercially available products designed for this purpose. Other clinicians opt to secure catheters with suture to provide an extra protection against accidental dislodgement. Suturing catheters to a patient’s skin is generally felt to be a safe practice, although some infectious complications have been linked to suture technique and contamination . Other risks of securing catheters with suture include skin ischemia and the risk of damage to the catheter upon suture removal. Scissors or scalpels used to remove the suture can inadvertently transect the arterial catheter. Despite this known risk, clinicians continue to use sharp tools to remove sutures in close proximity to catheters. However, only one case report has been published describing a retained catheter fragment in the radial artery caused by accidental catheter transection during arterial catheter removal . Complications of retained intra-arterial foreign bodies include endothelial injury and migration downstream resulting in pain, ischemia and thrombosis. To our knowledge, this is only the second known case report of a catheter becoming dislodged and retained in a patient’s artery because of transection during suture removal. While arterial catheter transection resulting in a retained fragment is an exceedingly rare event, this case highlights the extraordinary need to develop safer and more effective techniques to secure and remove arterial lines so as to obviate the need for suture placement and removal. The authors advocate the use of commercially available devices for securing these catheters without the need for sutures to decrease the risk of catheter damage and transection during removal. This research was funded in part through the NIH/NCI Cancer Centre Support Grant P30 CA008748. Koyfman AM (2017) Arterial line placement. In: Rowe VM ed. Clinical Procedures: Medscape. Frezza EE, Mezghebe H (1998) Indications and complications of arterial catheter use in surgical or medical intensive care units: Analysis of 4932 patients. Am Surg 64: 127-131. Nuttall G, Burckhardt J, Hadley A, Kane S, Kor D, et al (2016) Surgical and patient risk factors for severe arterial line complications in adults. Anesthesiology 124: 590-597. Scheer BV, Perel A, Pfeiffer UJ (2002) Clinical review: Complications and risk factors of peripheral arterial catheters used for haemodynamic monitoring in anaesthesia and intensive care medicine. Crit Care 6: 199-204. Lee SY, Na HS, Kim MH, Kim CS, Jeon YT, et al (2010) A sheared catheter fragment in the wrist after arterial cannulation attempt: A Case report. Korean J Crit Care Med 25: 118-121. Shah US, Downing R, Davis I (1996) An iatrogenic arterial foreign body. Br J Anaesth 77: 430-431. Ho KS, Chia KH, Teh LY (2003) An unusual complication of radial artery cannulation and its management: A case report. J Oral Maxillofac Surg 61: 955-957. Scheer BV, Perel A, Pfeiffer UJ (2002) Clinical review: Complications and risk factors of peripheral arterial catheters used for haemodynamic monitoring in anaesthesia and intensive care medicine. Crit Care 6: 199. Durie M, Beckmann U, Gillies DM (2002) Incidents relating to arterial cannulation as identified in 7,525 reports submitted to the Australian incident monitoring study (AIMS-ICU). Anaesth Intensive Care 30: 60-65. Chim H, Bakri K, Moran SL (2015) Complications related to radial artery occlusion, radial artery harvest and arterial lines. Hand Clin 31: 93-100. Miyasaka K, Edmonds J, Conn A (1976) Complications of radial artery lines in the paediatric patient. Can J Anaesth 23: 9-14. Baserga MC, Puri A, Sola A (2002) The use of topical nitroglycerin ointment to treat peripheral tissue ischemia secondary to arterial line complications in neonates. J Perinatol 22: 416-419. Ball DR, Stott SA, Rouse R (1996) Locating an arterial foreign body by ultrasonography. Br J Anaesth 77: 811. Kim IS, Shin HK, Kim DY (2013) Iatrogenic catheter sheath shearing during radial artery cannulation. Korean J Anesthesiol 65: S12-S13. Mayne D, Kharwar F (1997) Another complication of radial artery cannulation. Anaesthesia 52: 89-90. Moody C, Bhimarasetty C, Deshmukh S (2009) Ultrasound guided location and removal of retained arterial cannula fragment. Anaesthesia 64: 338-339. Rais-Bahrami K, Karna P, Dolanski EA (1990) Effect of fluids on life span of peripheral arterial lines. Am J Perinatol 7: 122-124. Moon SK, Gong JC, Kim JH, Lee KC, Kim HY, et al (2012) A retained catheter fragment in radial artery caused by accidental catheter transection during arterial catheter removal. J Anesth 26: 625-626. Liau DW (2006) Injuries and liability related to peripheral catheters: a Closed Claims analysis. ASA Newsletter 70: 11-13.